Move over Super Guide, Microsoft is attempting to patent an in-game hint system of its own. 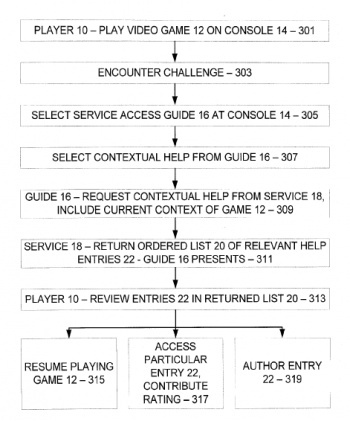 Microsoft has filed a patent for an in-game hint system accessed through Xbox Live that is very similar to GameFaqs and other community-based hint/walkthrough websites. It is contextual, meaning that the guide will try to find help that is authored specifically to where a player is currently stuck in a particular game. This is contrasted by Nintendo's patent for its Super Guide hint system, already implemented in New Super Mario Bros. Wii, which basically plays a certain level automatically but lets the player jump in at any time. Simple in-game access to GameFaqs would probably have been an easy way to tackle this idea, but Microsoft evidently wants to take the idea of a "faq" website and make it even more helpful. For example, Microsoft's hint system would allow authors to add audio, and to take screenshots and video which can be marked with a digital pencil to point out specifically where to go and what to do. While a "faq" (which stands for "frequently asked questions") can be very useful, it sometimes cannot express with full detail exactly how to complete a certain task. Aspects of each hint guide can be tagged, including situations and items, which should allow users to get the specific hint that they want at a specific time. The guides will also be ranked by users to weed out the garbage, and also the likely flood of false hints and lies. This type of system needs to be implemented with care, based on how well the Xbox 360 audience is known to follow Penny Arcade's model for online human interaction.